Does it even work (and how)? You wouldn’t believe how much unnecessary kitchen waste we all produce every day. We’ve already told you how to reuse and eat kitchen scraps. This time, we’ll show you how to regrow kitchen scraps on your windowsill. 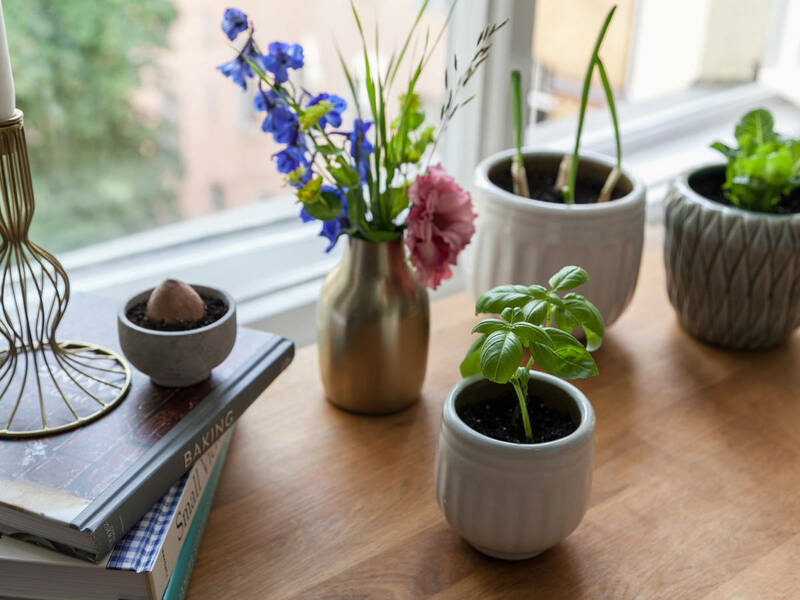 In the last few weeks, we’ve developed a green thumb in the office in order to show you 3 plants that will regrow surprisingly easy and fast–plus one that sadly failed to thrive (our plant of sorrow). Have you tried regrowing vegetables, herbs, or fruits from kitchen scraps? Share your best tips in the comments below, or upload a picture of your small kitchen garden! How does it work? Transfer the root ends to a jar and cover halfway with water (they should not be covered completely). Place the jar on the windowsill with lots of light and change water daily. Since roots will keep growing, you can transplant your green onions to soil after 1 – 2 weeks. How long does it take? After a few days, spring onions will regrow. It only takes 1 – 2 weeks until they are large enough for you to harvest fresh green onion. How does it work? It almost sounds too easy to be true. Just cut off two basil sprigs (approx. 2 – 4 in. )—they don’t even need roots. Transfer them to a jar and fill halfway with water. Place in sunny area and change water daily. As soon as roots have grown, transplant to a pot with soil. How long does it take? New roots will grow after a week already, and you can harvest fresh basil after 2 – 3 weeks. Prospects of success? Very good! If you care for it well, you never have to buy basil again. How does it work? Normally, you’d throw away the tough end of a romaine heart. Instead, transfer it to a bowl that’s filled halfway with water. Place can transfer to soil. How long does it take? You’ll already spot new small leaves after 3 – 4 days. Transplant it after 7 – 10 days and harvest your own little romaine lettuce after approx. 2 – 3 weeks. Prospects of success? Superb! We recommend re-growing several plants at the same time. As you can see, not much has happened (yet). Our child of sorrow needs a lot of time and patience. How does it work? Re-growing avocado works best with a pit from a very ripe fruit. Push toothpicks into the pit to balance it over a small jar with water. Make sure that the pit is pointy side-up and only the lower third of it is covered with water. Place in a light, sunny spot and change water daily. As soon as first roots and stem begin to grow, transplant it to soil, but make sure that the top half of the pit is still above ground. When your tree gets bigger, plant it in a larger pot. How long does it take? It can take up to 6 weeks until the pit will split open and roots and leaves start to grow. Afterwards, you need to stay patient, because it can take 3 – 6 months until you’ll be able to spot a single leaf. Phew. Prospects of success? Uncertain. Some pits regrow and some don’t, so better try out two or three pits simultaneously. These are just four ideas to start with, but there are plenty more possibilities! You can regrow all kinds of herbs, as well as garlic, lemon grass, onions, bok choy, carrots, celery, mushrooms, and even pineapple in your own kitchen! Have fun and—hopefully—a green thumb! Is the Mediterranean Cuisine Really That Healthy? Between Trend and Tradition: These Street Foods Conquer the World!